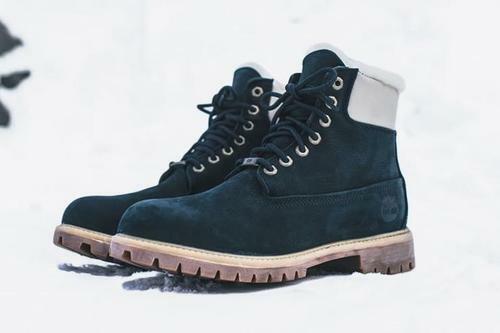 Kith-founder Ronnie Fieg has once again teamed with Timberland for a new collection boots, marking the third chapter in their partnership. Including in the latest Kith x Timberland drop are two different colorways the 10" 40 Below Super Boot and a navy colorway the more familiar 6" Construct. According to Kith, the two 40 Below Super Boot colorways serve as a nod to staple original executions the 6” Construct boot, which include waterpro black nubuck and distressed rust leather. Both are entirely lined in shearling and feature quilted collars crafted from full grain leather. Both the black nubuck and distressed rust leather colorways will retail at $300. The 6” Construct comes in a waterpro navy nubuck, accompanied by a cream leather collar and full shearling lining which provides optimal warmth during the winter season. The Shearling 6” will retail at $250 USD. The trio Kith x Timberland boots, each which comes in special co-branded packing, will release tomorrow Saturday, January 20th at all Kith shops except Kith Miami, as well as online at 11am ET on Kith.com.